We've covered the basics of marking stitching lines - see my post and Kristin's post. 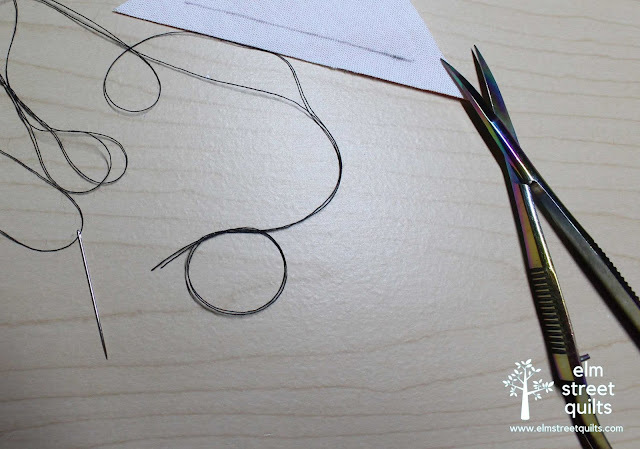 The most important thing to remember is to mark your stitching line such that it starts and ends 1/4'' from each edge. 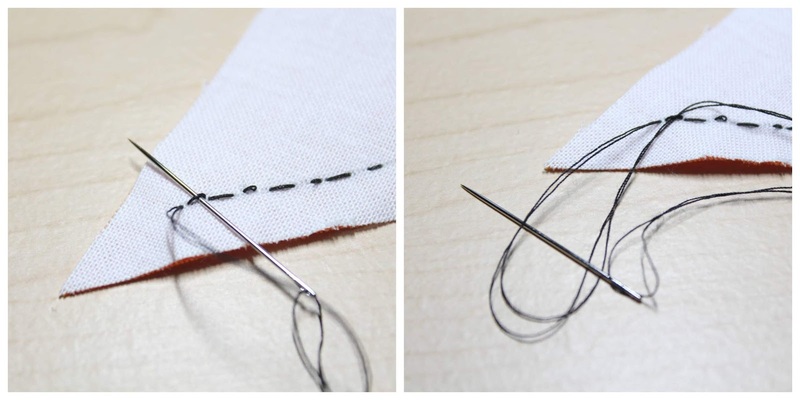 With stitching lines marked, let's cover the basics: the knot, the running stitch, and the back-stitch. My post will cover this in photos and Kristin has published a wonderful video. A simple knot is all you need - just make a loop at the end and pull through the thread tails. There are several other types of knots you could use as Kristen demonstrates her video. At the end of stitching, I typically pull my needle under the last stitch, make a loop and make a knot. 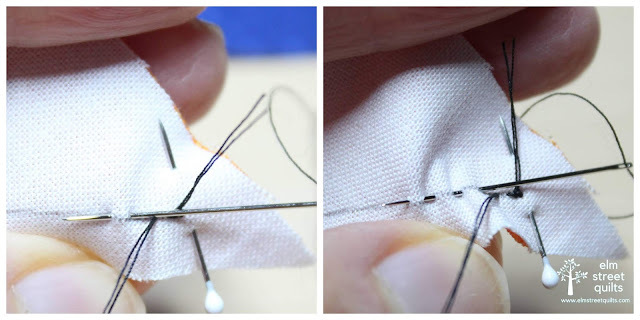 Continue taking one stitch at a time, working to get your stitches even. 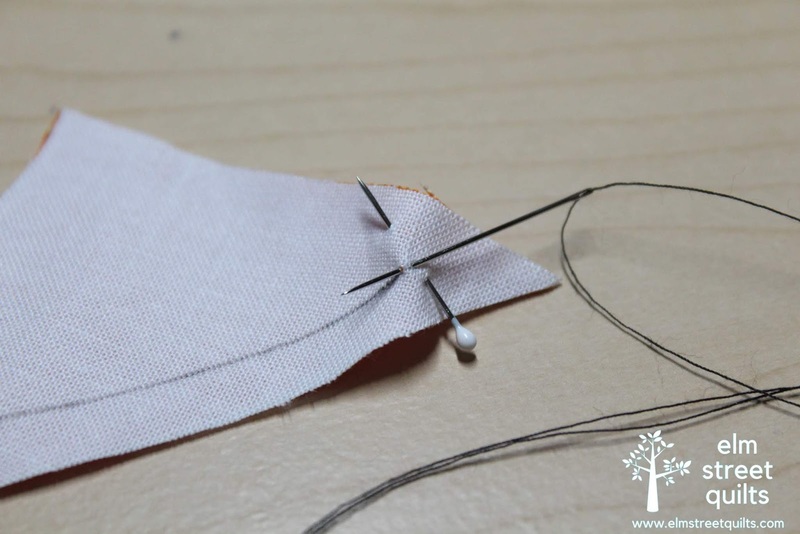 You can also pick up several stitches on your needle by rocking the needle in and out and using your left hand to push the fabric onto the needle. You should try for 5 - 6 stitches per inch. 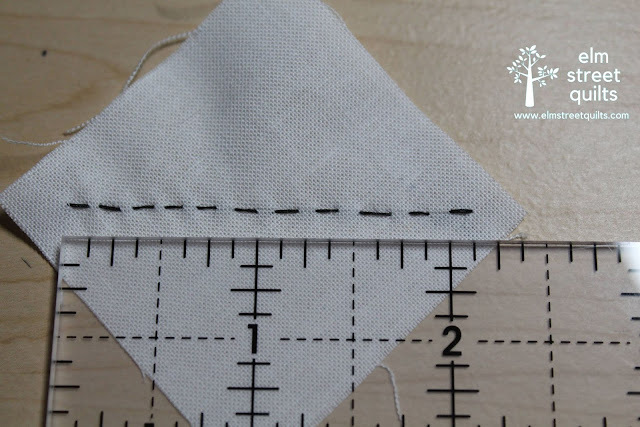 With practice, your stitches will become reasonably uniform in size. Start by making a single running stitch. Then, bring your needle back down through that first initial hole (or something right next to it) and then back up again as if you are making another running stitch. And remember, back-stitching every 5-6 stitches in key for maintaining proper tension. 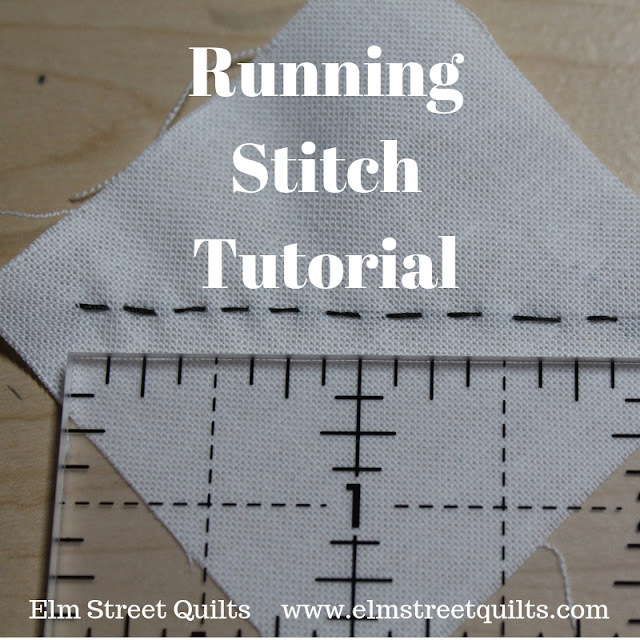 If you've never done a running stitch before, give it a try. Don't forget to take a look at the wonderful video Kristin from Simple Handmade Everyday made on the running stitch. Good advice! I wouldn’t have known to do a back stitch every 5 or 6 Stitches, but it certainly makes sense. Thank you both for your efforts in prepping us for this project! I love the information you are sharing together. Thank you so much! And thank you for linking up with the Festival! This is great information Patty. We will all know what we are doing when the quilt along starts. Great tutorial, I am a complete novice with hand quilting and your tutorial and pictures are wonderful. Thanks for linking up to the tips and tutorials festival! Hi, Patty. Love your blog, I read every post. 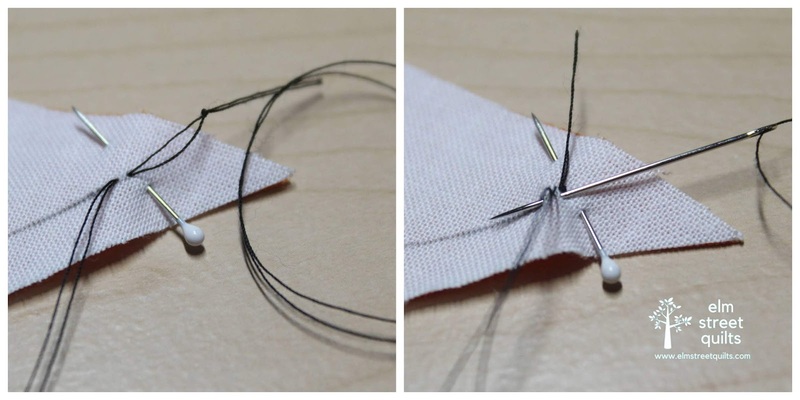 To help reduce thread tangling, remember thread has a direction. The needle needs to be away from the spool and the knot, or beginning stitch needs to be at the spool end of the thread. A quick pull through beeswax or thread heaven helps a bunch, too. Forty years ago when I first introduced to hand piecing, I was taught to use the quilters knot for piecing as well as hand quilting. I also was taught NOT to start piecing in the corner. I start a couple of stitched from the corner and take a couple of running stitches int0 the corner, turn my work and then start as usual. This prevents the knots from all being in corners when it comes time to quilt the flimsy. 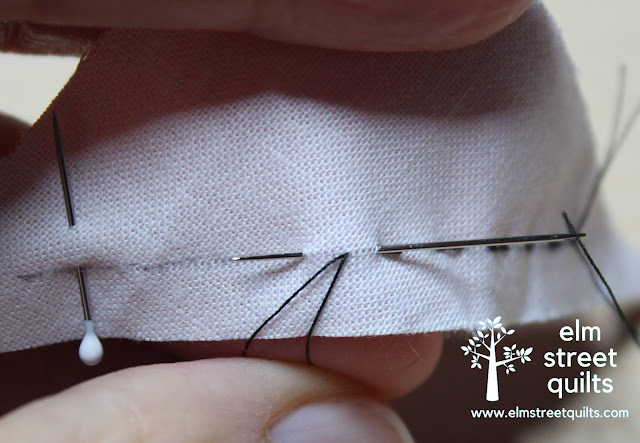 If you are stitching in the ditch, you can run into multiple nots in a seam. Also, this "locks: the stitches in place. When I get to the end of a seam, I turn my work and take a couple of stitches before I finish off my thread, again locking my stitches. I use one strand of thread and run it through beeswax which helps tangling issues and also helps it glide through the fabric. My first and only hand pieced quilt is an UFO because of criticism from my then husband. It is a king sized quilt and all the piecing in down and some of the rows are sewn together and quilted using Georgia Bonesteel's lap quilting method. It's somewhere in the attic and will probably be there when I leave this house. I hopw peoplel will take time to real each blog. I got great information from each of them. I don't know if there was the same information or if I missed something on one and found it on the other. I know you have a little different process. Also, I do mark my seam allowance of all my pieces. Since I learned a long time ago, our class did not have the modern conveniences of rotary cutter and mat. We did everything with plastic or cardboard templates, rulers, scissors, and pencils. So in order to try to make sure that my pieces were aligned as well as I could, I not only lined up the sides of the pieces but also used the seams as another check point. I hope people will use a sharp pencil as different pencil will add breadth to the seam line and can cause a variance in the intended size of the finished block - more noticable in smaller blocks where precision really matters. Thanks for doing this. Thank you, for posting this. I started piecing in 1992. I was taught many of the same methods as you. We didn't do the "back" stitch. It was thought the extra stitch would add "slight" enough bulk to cause "wear" in the quilt. I use a lead pencil. We also marked the "grain" of the fabric.